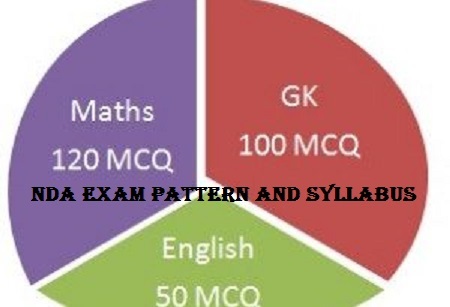 NDA exam pattern and syllabus 2019 – Dear NDA aspirants, it is very essential to know the background of the exam and its question pattern, before taking it the actual exam. Additionally, to appear in the exam you should be aware of and be prepared enough with the syllabus, question pattern, general awareness and previous year papers. In this segment, we will update explicitly with a wholesome information on National Defence Academy, NDA exam pattern and syllabus from which the questions are asked. National Defence Academy (NDA) is a military academy which was established on 7th of December,1954. The campus location is in Pune, Maharashtra, India. The motto of NDA is “Service before self”. In general, the NDA exam is held after 10+2 examination. Union Public Service Commission(UPSC) conducts this exam twice a year.And of course, through this national level entrance exam, you can get to serve in Indian Defence Services. Moreover, it provides opportunity for entrance in Indian Army, Indian Navy and Indian Air Force. Once the cadet clears this examination, They need to undergo a training of three years in the Academy. This training is in sync with the graduation with BA/BSc or BCs (Computer Science) degree of Jawaharlal Nehru University. Besides academic training, the candidates are also equipped with outdoor skills like drilling, physical training and games. In the first place, NDA always puts more stress on character building, esprit-de-corps, mental and physical flexibility and rigidness, leadership and a sense of observation. Find here all the information on NDA exam pattern and syllabus. NDA Question paper consists of two papers- Mathematics and General Ability. Each paper is of 2 hours 30 minutes. Mathematics question paper contains 120 questions of total 300 marks. Each question is of 2.5 marks. Not to mention, for each incorrect response 0.83 marks is deducted. General ability paper is of 600 marks consisting of 150 questions. In general, this paper includes English and General Knowledge. English is of 200 marks with 50 questions and General Knowledge paper has 100 questions of 400 marks. Also,1.33 marks will be reduced for marking incorrect answer. Time management and efficiency will obviously help you in clearing the exam with good scores. In fact, the cadets who manage to clear the NDA written exam are called for SSB interview. Furthermore, this follows with intelligence, personality, physical and medical test. Concept of a set, Operations on sets, Venn diagrams, De Morgan laws, Cartesian product relation, Equivalence relation, Representation of real numbers on a line, Complex numbers – basic properties, Modulus argument, Cube roots of unity, Binary system of numbers, Conversion of a number in decimal system to binary system and vice-versa, Arithmetic, Geometric and Harmonic progressions, Quadratic equations with real coefficients, Solution of linear inequations of two variables by graphs, Permutation and Combination, Binomial theorem and its application, Logarithms and their applications. Types of matrices, Operations on matrices, Determinant of a matrix, Basic properties of determinants, Adjoint and inverse of a square matrix, Applications – Solution of a system of linear equations in two or three unknowns by Cramer’s rule and by Matrix Method. Random experiment, Outcomes and associated sample space, Events, Mutually exclusive and exhaustive events, Impossible and certain events, Union and Intersection of events, elementary and composite events, Conditional probability, Bayes’ theorem – simple problems, Random variable as function on a sample space, Binomial distribution, Examples of random experiments giving rise to Binominal distribution. By and large, this is the complete information of the NDA exam pattern and syllabus. If you go through the previous year papers, you will get an idea of which topics cover majority questions. Also, this will make the process of preparation for the exam easier. Additionally, for any queries on NDA exam pattern and syllabus 2019, feel free to comment below.